A reader emailed me a link to a fascinating photo-essay called "What the World Eats," in which 16 families from around the world are shown at home with a week's worth of food, and the amount of money they spent on it. Take a look! They seem to drink a lot of beer! Ok, so that is not the surprising part of the series. What surprised me was that families in a lot of countries seemed to be spending between US$150-200 a week, in the U.S., Poland, and even in Mexico and China. Of course, what we don't know is how each family compares to the median income in that country. Most of the families in the photos would probably look more or less "middle class" to American eyes, but some are probably quite wealthy compared to others in their countries. What I also found interesting was the different kinds of food each family ate. The Mexican family apparently drinks about a dozen two-liter bottles of Coke in a week. But they eat loads of fruits and vegetables. The Americans and Brits, on the other hand, have a much lower proportion of fresh produce, and more meat and carbs. In all but the poorest countries, there is at least some evidence of Coke, McDonald's, KFC, or Burger King within the week's eating. Who were those poorest countries? Bhutan at about $5 a week and Chad at $1.23 were the bottom of the list. The difference in money spent is not nearly as striking as that in the actual volume of food when you look at the photos. I will certainly look at my kitchen a bit differently when I go in there to cook dinner after finishing this post. I have spent an average of about $131 per week on food year to date, but aside from my mother's 3-week visit when I was doing a lot of entertaining, that was all pretty much for one person. And I think I spend less than most people at my income level in this city. I'd love to see a version of this photo essay comparing a variety of New Yorkers... but it would be harder to photograph them with their groceries, since people here eat in restaurants so much! Thanks again to Katrina for sharing the link! I checked out that book from the library and was pretty amazed at the selection we in the west(and EU)compared to the rest of the world. It made me feel better about my choices in life and that I could scale down, because of the other people I saw. $500 a week on food? Wow. I thought we were bad. We're trying to reign it in to spend $200 a week for gas and groceries. I think I'm going to have to learn to be more creative in the kitchen. Thanks for the post. I'll look for the book. It is always interesting to see how other people live. Fascinating take on eating. I think I know how to feed my family on $50 a week but that would involve lots of coupons for processed foods, a lot of cooking, and no eating out. So while I wish for our savings account's sake that we weren't average, we are. But at least we're healthier (and saner!) for it. Maybe some day when my kids are older and I have more time, I will try to have us eat like families in different countries for a week at a time. That would be an interesting experiment! 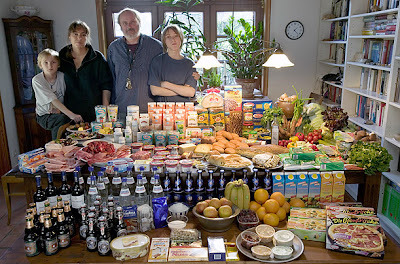 The photographer and author chose average households for Material World and revisited many of the same families for Hungry Planet. So yes, the families generally are close to the median income. I loved both books, they're really eye opening. Material World made me more aware of all the STUFF I have, and Hungry Planet made me aware of how prevalent smoking is worldwide (they included alcohol and tobacco in the groceries $$ and the pictures). Trying to picture an "average week" of my household's food is mind stretching.